"Tradeshows are a difficult venue: there's a lot of competition for the attendee's attention. So it's critical to use a presenter that is able to cut through the din, truly engage the audience and deliver your message. Karen Kahn is that kind of presenter. She is smart, attractive, and instantly connects with people. 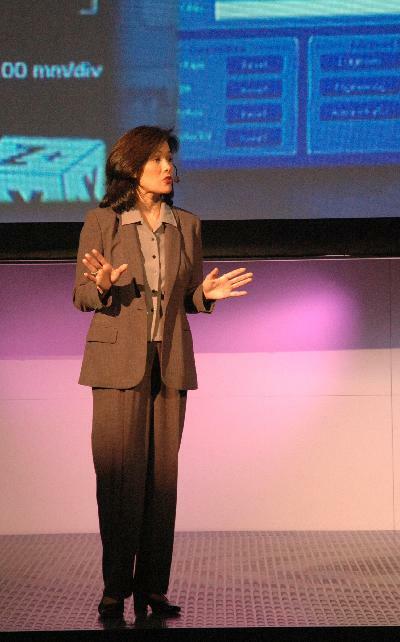 Whether in New York, Silicon Valley or Singapore, Karen effortlessly presents complex messaging with competence and sincerity--and keeps the audience engaged. She is a real pro, and a joy to work with!" "Karen's professionalism, high energy level and enthusiasm shines through at every presentation as our live talent at our largest annual trade show event. She's versatile, reliable and we count on her to deliver our marketing message to our most important audience. She's on top of her game." "I love working with Karen because I can actually leave the booth or show and totally rely on her to take care of business. Whether it's a medium-sized kiosk or a million dollar booth, I can always count on Karen. Her presentations are professional and concise and her warm personality brings the audience to believe that she is part of the company team....not just a hired actor. Staff and crew love working with her too as she is truly a part of the gang."